We’d love your help. Let us know what’s wrong with this preview of Fiddle Fever by Sharon Arms Doucet. Although it is 1914 and the world is changing all around him, Felix LeBlanc feels trapped on his Louisiana farmhouse, where nothing ever happens. When he hears his uncle, ’Nonc Adolphe, play the fiddle for the first time, he knows there’s music in his blood, and he’s determined to be a musician, too. However, he’s too poor to buy his own fiddle, and to make matters worse, Although it is 1914 and the world is changing all around him, Felix LeBlanc feels trapped on his Louisiana farmhouse, where nothing ever happens. When he hears his uncle, ’Nonc Adolphe, play the fiddle for the first time, he knows there’s music in his blood, and he’s determined to be a musician, too. 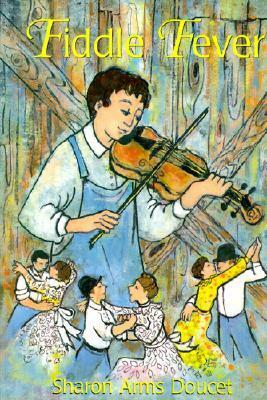 However, he’s too poor to buy his own fiddle, and to make matters worse, Maman has forbidden him to even touch one, fearing that he’ll choose the wayward life of a fiddler. And so Felix begins to build his own fiddle out of a crude cigar box and a piece of cypress wood, keeping it a secret from his family and even his best friend, Chance. It is a solitary journey that will require all of his ingenuity—and place at risk the relationships that are dearest to him. Set against the colorful backdrop of the Cajun bayous, Fiddle Fever relays an important message about the universal need for self-expression and the compromises we must all make in our search for individuality. Glossary of French terms. To ask other readers questions about Fiddle Fever, please sign up. It is interesting that the cigar box fiddle that 14-year-old Felix makes in Cajun Louisiana is patterned after a real incident. It is based on the true story of Conray Fontenot, who, in his youth, built his own cigar box fiddle because his family had no money to buy him a fiddle. He later became a famous fiddler. Another interesting thing is that the author, Sharon Arms Doucet, is married to a man who is a famed fiddler and musicologist specializing in "cajun" music of Louisiana. From her own s It is interesting that the cigar box fiddle that 14-year-old Felix makes in Cajun Louisiana is patterned after a real incident. It is based on the true story of Conray Fontenot, who, in his youth, built his own cigar box fiddle because his family had no money to buy him a fiddle. He later became a famous fiddler. ohhhhhhhhh!!!!!!!!!!!! wat a grrrrrrrreeeeeaaaaaat book!!!!! loved the storyline and one child's views of adults and coming of age to understand why they make the choices they do and that family is important.